Nine Uighurs have been executed for taking part in ethnic rioting that left nearly 200 people dead in July, the first suspects put to death in the unrest, the official China News Service reported Monday. The nine were put to death recently after a final review of the verdicts by the Supreme People's Court as required by law, the news service said, but gave no specific date or other details. They had been convicted of murder and other crimes committed during the riots in the western city of Urumqi in China's worst ethnic violence in decades. Hundreds of people were rounded up in the wake of the riots, in which Uighurs attacked members of China's Han ethnic majority on July 5, only to face retaliatory attacks two days later. Uighurs are a Turkic Muslim ethnic group linguistically and culturally distinct from the Han and many resent Beijing's heavy-handed rule in Xinjiang, their traditional homeland. 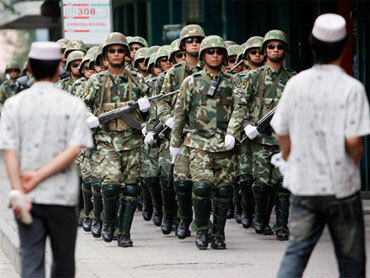 China blames the rioting on overseas-based groups agitating for broader rights for Uighurs in Xinjiang. Four months after the violence, Xinjiang remains smothered in heavy security, with Internet access cut and international direct dialing calls blocked. The news service said another 20 people were indicted on Monday on charges related to the deaths of 18 people and other crimes committed during the riots. All but two of the prisoners listed in the report had Uighur sounding names, with the others appearing to be Han. Overseas Uighur activist Dilxat Raxit condemned the executions as motivated by politics and the need to appease Urumqi's angry Han residents, who marched in the thousands through the city in September to demand trials of those responsible for the July violence and the perpetrators of a bizarre series of hypodermic needle attacks. "We don't think they got a fair trial, and we believe this was a political verdict," said Raxit, who serves as spokesman for the Germany-based World Uyghur Congress. "The United States and the European Union did not put any pressure on China or seek to intervene and for that we are extremely disappointed," he said.